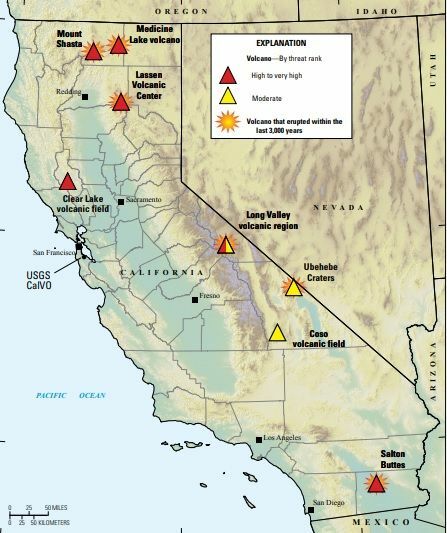 Volcanoes in California more likely than quakes? Oh, by all means, let’s get scared about something else. The article helps put the risk of quakes into perspective tho. The U.S. Geological Survey (USGS) has warned that California’s next big hazard could come in the form of a volcanic eruption—not a massive earthquake, landslide or wildfire, which the state is often known for. Estimating the risk based on the past 5,000 years of volcanic activity, the report found there is a 16 percent chance of a small to moderate-sized eruption over the next 30 years. By comparison, there is a 22 percent chance of a magnitude 6.7 or larger earthquake at the San Andreas Fault in the San Francisco Bay Area in the next 25 years. According to the USGS, there are eight young volcanic areas that could pose a risk to California, ranging from the border of Oregon to Mexico. The report assesses these volcanoes for their risk, looking at general state of unrest, the type of volcano, the tendency toward violent eruptions and the frequency of eruptions. The report also looked at their location in relation to land use, such as population. The report said that seven of the volcanoes assessed have magma beneath them, meaning they are considered “active.” They are the Medicine Lake volcano, Mount Shasta, the Lassen Volcanic Center, the Clear Lake volcanic field and the Long Valley volcanic region. The latter, in the Sierra Nevada Range, is one of the biggest calderas in the world, measuring 20 miles by 10 miles. It formed during a “supereruption” around 760,000 years ago. Explaining what happens when a volcano erupts, the USGS said a series of events unfold: “Steam blasts, noxious gas emissions, and landslides may occur as magma (subsurface molten rock) ascends into the volcanic edifice,” the report said. The report said that, unlike other natural disasters, the associated hazards of volcanoes can sometimes last for decades, making understanding the risks they pose all the more important. The report found that a volcanic eruption will be more than just a local problem, with any event likely to affect the natural resources and infrastructure on a wide scale. It said the next steps will be to assess specific volcanoes and sites for vulnerabilities so mitigation strategies can be fully developed.